A 66-year-old woman was sexually assaulted in an Uptown park this month, police said. A career felon has been charged in connection with the attack. 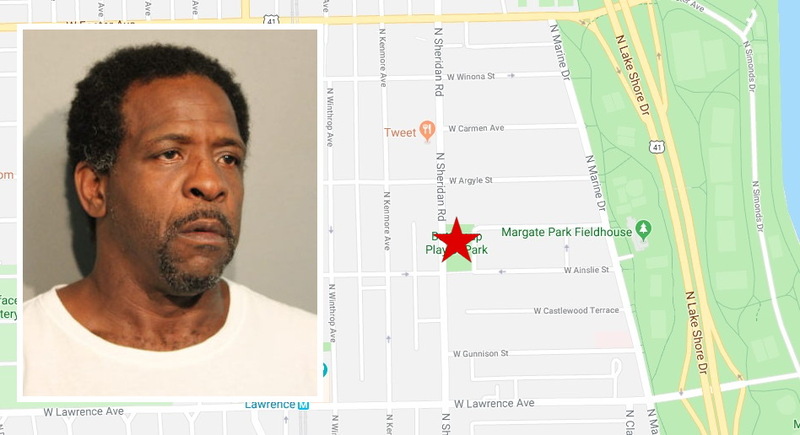 The woman was at the Buttercup Playlot, 4901 North Sheridan, shortly before noon on July 20th when 19-year-old Arnie Spaulding approached her and threatened to shoot her, according to police. At the same time, police say, a 49-year-old man who was with the woman was punched in the head and neck by 56-year-old Derrick Burke. Burke then touched the woman inappropriately and then sexually assaulted her, police said. Burke and Spaulding were arrested about 30 minutes later in the 900 block of West Lawrence. Burke has been charged with aggravated criminal sexual assault of a person over age 60; aggravated criminal sexual assault causing great bodily harm; aggravated battery of a person over age 60; and aggravated battery in a public place. He has been ordered held without bail. Spaulding was charged with assault and released on a recognizance bond. According to state records, Spaulding was paroled on July 12th after serving half of a one-year sentence for resisting police. Burke, however, has an extensive criminal record. He was most recently discharged from parole on July 4th at the end of an 8-1/2 year sentence for burglary. His previous prison sentences include two years for retail theft in 2009; two years for retail theft in 2008; six years for burglary in 2005; two years for retail theft in 2004; two years for retail theft in 2003; 18 months for retail theft in 2002; one year for retail theft in 2001; six years for burglary in 1996; three years for burglary in 1994; three years for robbery in 1988; another four years for burglary in 1988; and three years for burglary in 1983. He's due back in court on August 10th.